Grilled Tarragon Chicken, Quinoa, Avocado Salad, Weekly Menu Planner. Avocados have been so cheap and plentiful this summer that we are eating more of them then usual. I added one to the quinoa, with a bit of vinaigrette, making an impromptu, warm salad. Any Clafoutis left? 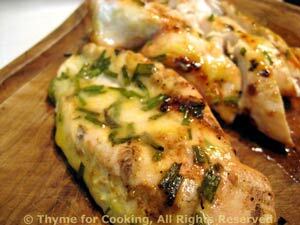 Tarragon is a great herb for chicken, and a classic pairing in French cuisine. When basting with a marinade, stop about 5 minutes before taking the meat off the heat, and turn the meat a final time to make certain the marinade is cooked. Mix all ingredients except chicken, whisking well. Pour over chicken and let marinate 10 - 15 minutes. Cook on barbecue grill for 8 - 12 minutes per side or until done (test - take a peak), basting with marinade. OR sauté in nonstick skillet for 8 - 10 minutes per side until nicely browned and done, basting with marinade. Serve. Quinoa is very high in protein and "contains a balanced set of essential amino acids for humans, making it an unusually complete food" according to Wikipedia. 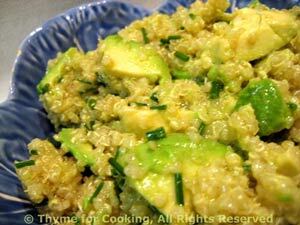 The avocado adds a creamy, luscious, element to the quinoa, (even if the color was a little strange). You can substitute Basmati or Jasmine rice. Uncover, fluff with a fork and allow to cool for a few minutes (or longer). Cut avocado, remove pit and slice. Cut the slices in half. Make vinaigrette: Put all ingredients into a small bowl and whisk well to combine. Add vinaigrette and chives to the avocado and stir gently. Add avocado to quinoa, stir to combine and serve. 1/4 - 1/2 tsp salt - sea salt if you have it. 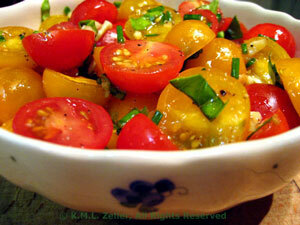 Put garlic and oil in a small serving bowl and let rest while you deal with the tomatoes. Cut tomatoes in half (that was tough). Add both to garlic oil and sprinkle with salt. Stir gently. This is good today, better tomorrow.